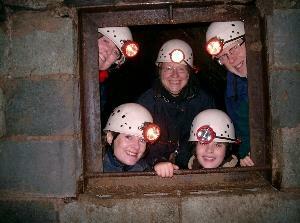 Explorer Trip at Corris Mine Explorers01654 761244work ExperienceOur trips take you into parts of the mine, hand-dug and worked by Victorian miners in 1836 and areas worked up until the 1970s when the mine closed. As the door creaked shut for the very last time a virtual time capsule was left behind which you can now explore. After years of research, our top Mine Guide will share stories of mining life as you explore the underground with some climbing and scrambling if you wish (these parts of the trip are optional). All of our trips run with a small group of explorers which means that we can largely tailor make them to suit your wishes, interests and abilities and those of the other members of your group. You'll discover old mining tools, machinery, drinking vessels, candles and cigarette packs discarded by the miners whilst stories of life in the mine spill out in such a way you can almost feel it creaking back to life. 100% authentic, adventurous and fun. Our trips take you into parts of the mine, hand-dug and worked by Victorian miners in 1836 and areas worked up until the 1970s when the mine closed. As the door creaked shut for the very last time a virtual time capsule was left behind which you can now explore. After years of research, our top Mine Guide will share stories of mining life as you explore the underground with some climbing and scrambling if you wish (these parts of the trip are optional). All of our trips run with a small group of explorers which means that we can largely tailor make them to suit your wishes, interests and abilities and those of the other members of your group. You'll discover old mining tools, machinery, drinking vessels, candles and cigarette packs discarded by the miners whilst stories of life in the mine spill out in such a way you can almost feel it creaking back to life. 100% authentic, adventurous and fun. We offer a 2 hour Mine Explorers trip (ages 10+), a Half Day Mine Expedition (ages 13+) and a Taster Trip (ages 8+) for younger visitors and for anyone wishing to try it out first. Open all year, pre-booking is essential. If you haven't booked and are passing please call in to check if a trip is running.